This is just to make you smile! In Kobarid we meet some additional friends from Germany, and as the weather was still reasonable, we opted for a walk before touring the museum to take advantage of the remaining sunshine. 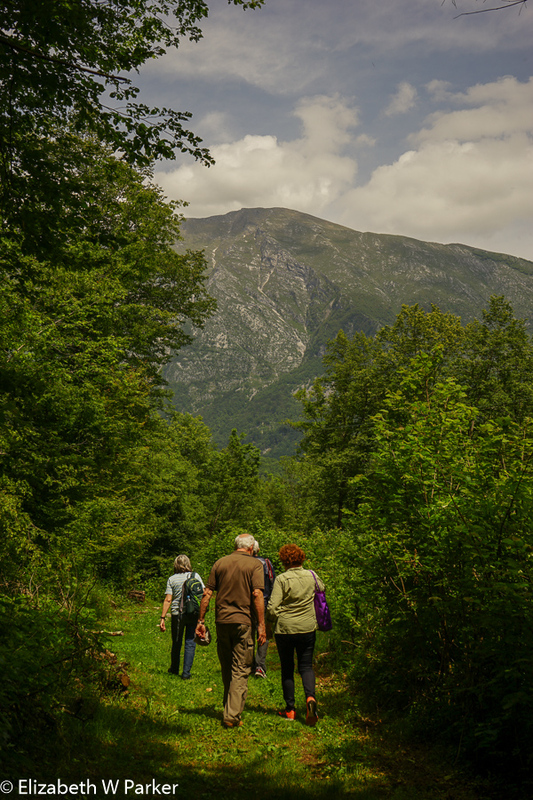 We were on the Historical Trail in Kobarid (got the map at the museum), rising up from the village, following the stations of the cross until we reached “The Italian Charnel House“. Though this place has other names, the stations of the cross must surely be related to the church of Saint Anthony which crowns the monument. The charnel house, or ossuary, was that built by Mussolini’s government, honoring the thousands of Italian soldiers who died in the First World War. The monument consists of concentric rings of arches, each set higher than the one before, each arch engraved with the name and details of soldiers who died in this area. Supposedly the bodies were rounded up from all the impromptu cemeteries established during the fighting and reunited here. Several of the arches are also dedicated to the unidentified soldiers. At the topmost ring is the church. We did not explore the monument as the group was intent upon walking (another for the list for the next trip!). We are dwarfed by mountains. 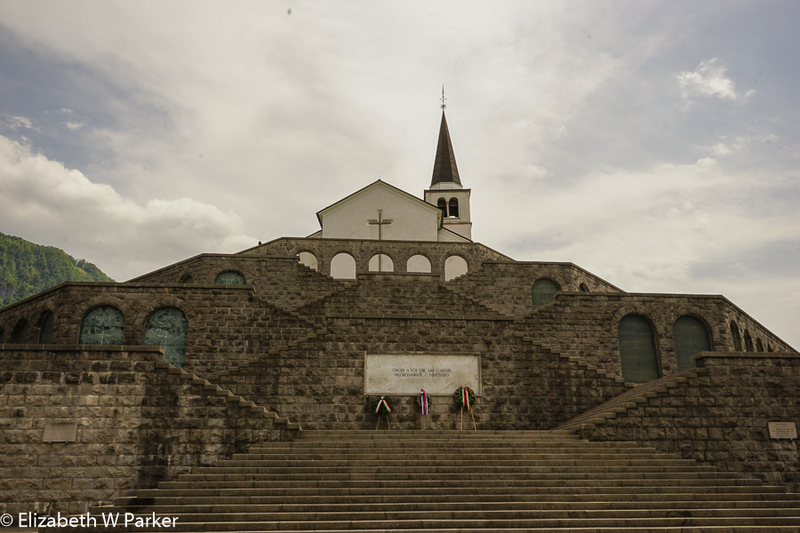 It was here that the battles on the Isonzo Front were fought. The restaurant specialized in meat cooked this way but we were too early by a half hour for those dishes. The outdoor oven had two chambers, the larger holding three immense pans on a rack. “Under the bell” seemed to refer to the large pans of food placed on a rack in the oven where coals, created by an intense fire in the smaller oven, were shoveled under the rack and piled on top of the covers of the pans. The ovens were hot! Our table was just in front of them and with the doors open it was uncomfortably warm, despite that our day was surprisingly mild. The “bell” refers to the shape of the cover on which the coals are piled. After lunch we continued our walk, crossing a very bouncy suspension bridge over the Soca River. 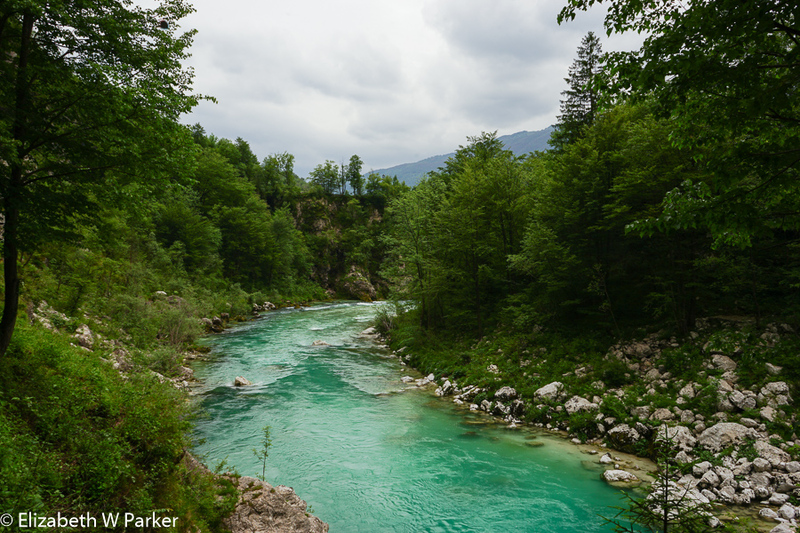 The Soca River – Yes! That color is real! The Soca (pronounced So-cha. (Sorry I don’t have the right diacritical marks to show you why – needs an inverted circumflex on the c) is an extremely important landmark/”personality” for this area. The Isonzo Front of WWI followed the line of the river. This is the part of the war about which Ernest Hemingway wrote in A Farewell to Arms and where he served as a Red Cross ambulance driver. The museum we will see later is dedicated to the story of the Soca Front. 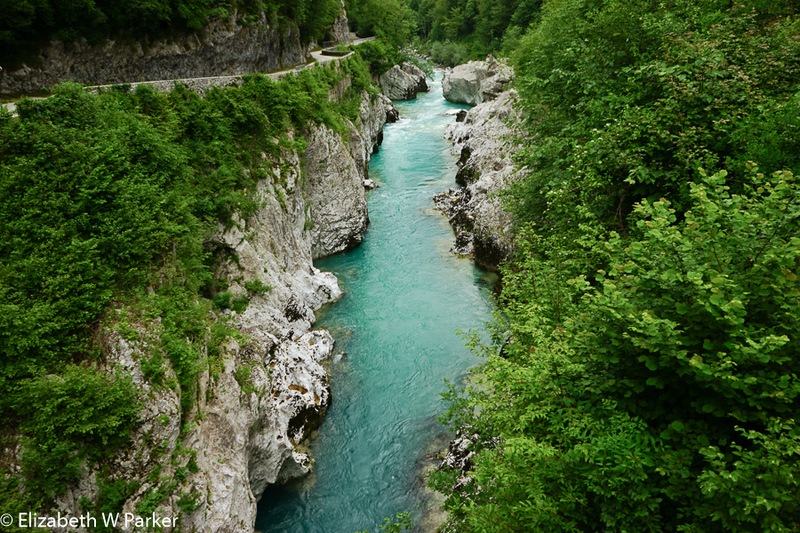 Today the Soca River is the focus of all kinds of water sports activities – fly fishing, rafting, canyoning, etc. From our suspension bridge we had a splendid view. We also had the heart-stopping experience of observing it while bouncing, suspended high over the river. Intrepid to the last, we stopped and posed for pictures anyway! Just before the bridge we had skipped a short detour to see the remains of WWI trenches. Once beyond it, the weather started to threaten, hurrying our footsteps back to town. We didn’t make it to the museum before the rain, but we didn’t get too wet, either. Entry wall of the Kobarid Museum. Sober reminder of what war really means. The Kobarid Museum tour began with an explanation by one of the docents, an overview of the history of the region covered by the museum. The tour officially began with a film about the front (named the Soca Front by the Slovenians and the Isonzo Front by most everyone else. Isonzo was the Italian name for the Soca River.) The film is made of the photographs on display in the museum, with a narration of the history of the battles during the two years that the front basically held. Changes in war tactics by the Austro-Hungarians, finally resulted in the defeat of the Italian forces and the pushing of the front south. 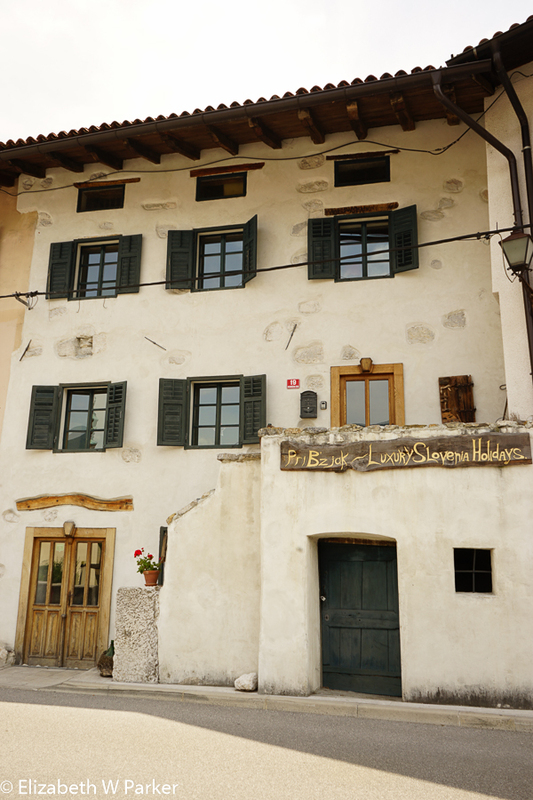 The museum covers the history of Kobarid from pre-historic times. There is evidence that this region has been inhabited since the Bronze Age. The real focus, though, is its role in WWI. 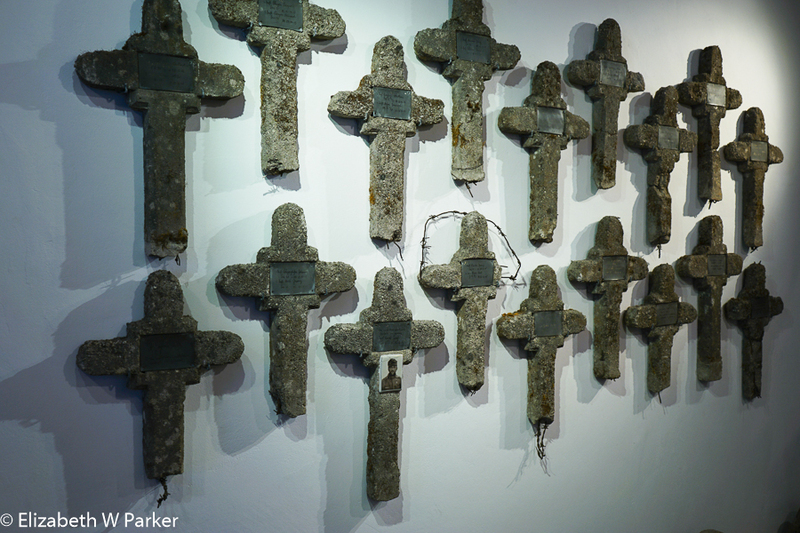 More than a museum about war, it is a museum about how much suffering war brings. 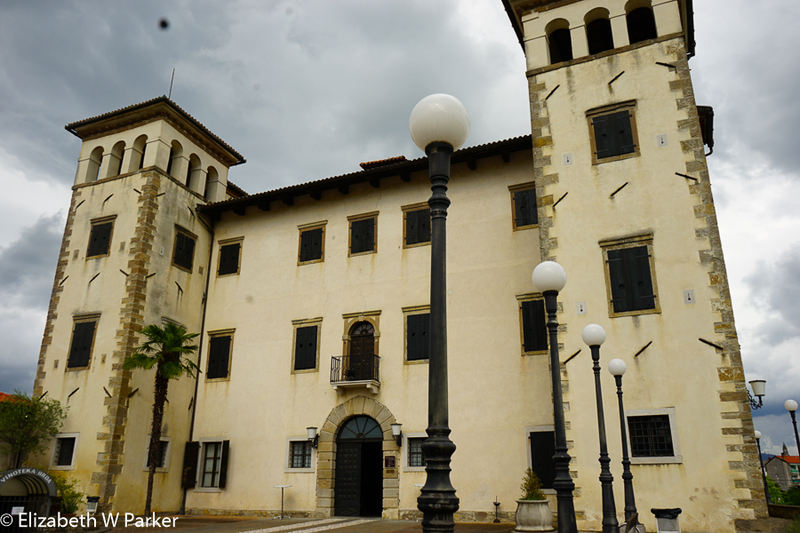 The museum is well-documented in English, German, Italian and Slovenian. As I mentioned earlier, the museum is a display of photographs of the war and the people of Kobarid. Lots of photographs. All are captioned. The period after the war is also covered and, of course, there is material about Tito. Reminder of what war means. Be sure you read it through. It is hard to advise you about visiting this site. We were lucky it seems to see the museum on a day when there were only about 20 other visitors in the building. 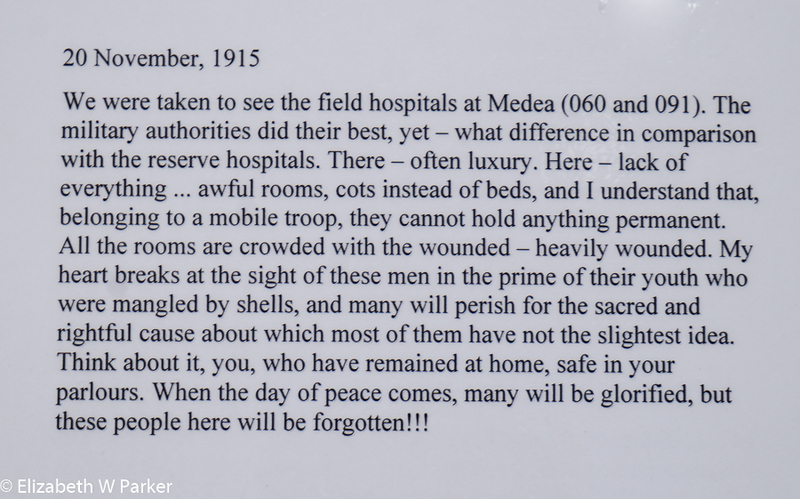 Others told us that during the summer it is so crowded that you cannot read the captions on the photos. I also have mixed feelings about it because I just cannot seem to emotionally decipher the battles and the war. I read about and I listen to it, but honestly there is a block in my mind. Usually when I read about battles I just try to figure out who won and move on, as troop movements and tactics go in one ear and out the other. I think both the museum (especially the video) and the charnel house should be seen…hopefully, they will have the intended effect: Reminding us that war is awful. Once we had seen the museum we drove another 30 minutes to Bovec, to our hotel. The rain was really heavy by this time, so we merely checked in, had cocktails in the lobby and dinner. Our hotel is the Dobra Vila Hotel and its restaurant is a real standout. Our dinner was served on a closed-in porch, with windows all around giving us dramatic views of the clouds, rain and mountains. We were served an amuse-bouche, a lovely salad with duck breast, a mushroom risotto and trout with asparagus. Our desert was a delicious buckwheat soufflé with burnt butter ice cream. Everything local and in season! The hotel itself is both interesting and memorable. The building was a relay station for cables between Rome and Berlin. Converted to a hotel, the décor evokes the 1920s, something that I have not seen in the other hotels where we have stayed. Most of those buildings were much older and either the décor was quite modern in that context (Antiq Palace in Ljubljana) or hearkened back to a golden age for the hotel (Savoie Excelsior in Trieste). Here, there are 1920s advertising posters framed on the walls and the furniture takes me right back to my grandmother’s house. It is very welcoming and calm. I was of course taken by the china and the table linens, everything done in red flower patterns, which was set off beautifully by the dark green of the wood trimming through the hotel. We spent two nights there, well taken care of by the attentive owner, Juri, and his small staff. Dtail map of the area. Sorry it doesn’t show you where in Slovenia it is! Our first stop was a pizzeria, and an enormous “small” pizza lunch! 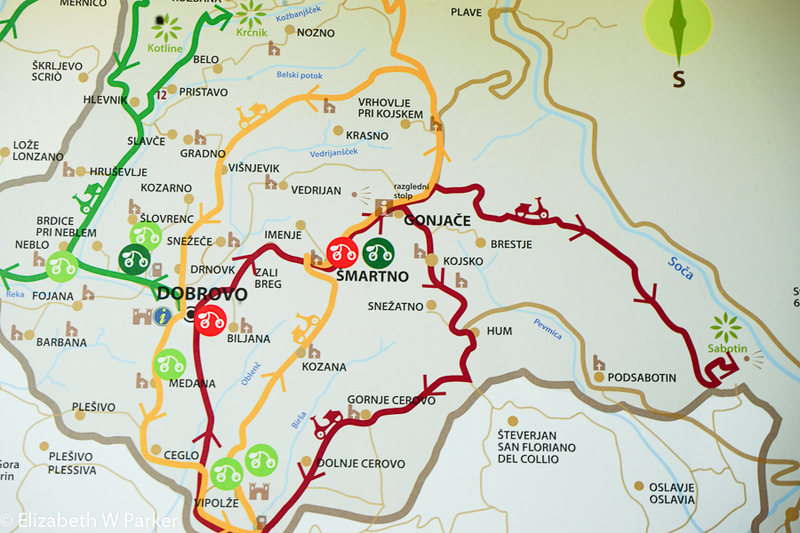 Due to bridge closure, we had to detour down to Nova Gorica and then head northwest to a little bulge of Slovenia that abuts the Veneto-Giuglia-Friuli wine region of Italy. We could easily have been in Tuscany! The views were nearly identical – a patchwork of vineyards and olive trees. Here we also found just picked cherries for sale. We stopped at a tourist information center in Dobrovo, and got a map of the region, but it was really not detailed enough to get us where we wanted to go – specifically on a walk to a natural stone bridge and some pools along the river. We did have sunshine by this point, so the walk we took a long a country road, winding back and forth across the stream was relaxing. Later, I discovered we had been on totally the wrong path for finding the stone bridge, and though disappointed, I just added that to the list of things I will do next time I come back. 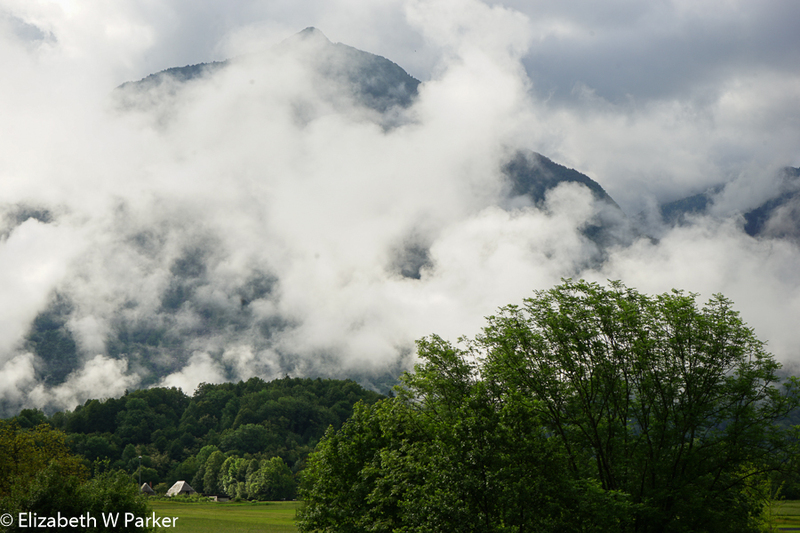 On the return trip to Bovec, we opted to take the road through Italy. That shortened our driving time considerably and gave us some new scenery, as we have already driven the Nova Gorica road twice! We did repeat the Kobarid to Bovec road for the third time, though. We know the curves by heart. An early bedtime capped our late evening arrival back in the hotel, still too full from lunch to even contemplate dinner. Tonight we said goodbye to our Russian friend, as she was headed out early for a return to Moscow. More rain is predicted for today, but the morning was partly cloudy, suggesting we might see something on a drive up and over the Vrsic Pass, so we tried to get up and on our way early. We said goodbye to our German friends and then headed northeast from Bovec, into the Triglav National Park and along the road to the pass. 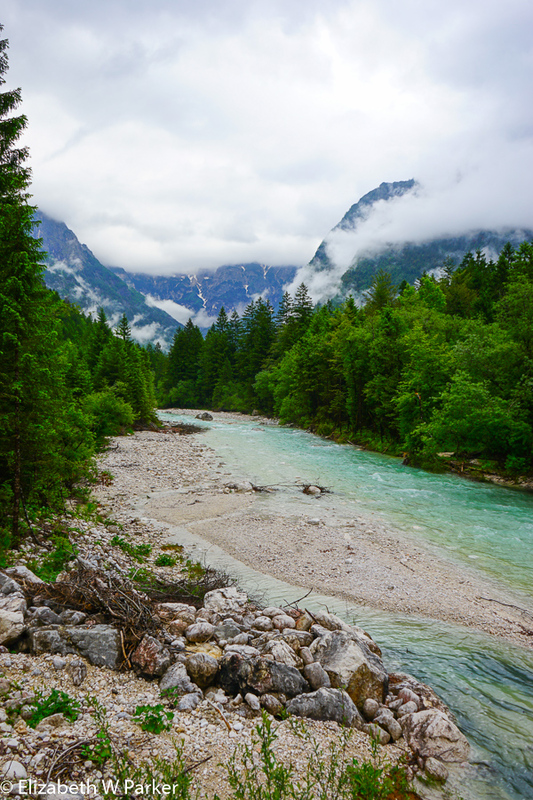 The Triglav National Park is named for the Triglav Mountain, the highest in Slovenia, and made up of three (tri) peaks. Just one more Soca River shot! The Vrsic (pronounced ver-sheech, there is an upside-down hat [inverted circumflex?] on both the s and the c) Pass is only open in the summer months. Along the drive, the houses have steeply pitched and low hanging roofs, designed to shed the all that snow (which also blocks the pass). We found snow along the road at the highest points. The road is famous for its switchbacks, 50 in all, and numbered along the way. The numbers are references for where to stop and see things, but by far the real attraction of driving this twisting, winding, curving, hairpin road is the views. We were moving in and out of fog and clouds, as well as patches of sunlight, while around us the mountains loomed, fading from view and popping out again. We stopped and walked (in the drizzle) through a botanical garden of alpine plants and flowers. The light was perfect (bright and diffused because of the clouds) and the colors vivid (saturated by the rain) so taking pictures was a joy. Here in Bled, our hotel is the Grand Hotel Toplice, a grand dame of the 1930s. We are situated right on the lake, and there is no question that I might fill up my camera’s card with pictures of the famous chapel on the island and castle on the mount. Before leaving for lunch, I had already started shooting – perhaps worried that the view was somehow going to go away during the three days we are here! We ate our lunch at a place called Okarina, just a 2-minute walk from the hotel, recommended to us by a woman staying in the Dobra Vila. Here we had the options of Slovenian food or Indian food. We entered right after the restaurant had finished serving a group of 44 Indians…the smell of curry just didn’t evoke Slovenia for me. The food was delicious – truffle pasta and a chamois with polenta – you see, we went for the Slovenian despite how much I love Indian food. After lunch, we greeted Dave and Donna, our guides from Next Step European Walking Tours, organized a rendezvous for 7 pm and then took a nap. Around 5, Gerry and I went out for a walk near the lake. There is a path that goes all the way around, but we didn’t really have time for that so we walked toward the chapel island. Occasional raindrops could not dampen my enthusiasm for the evening scene unfolding over the lake, so I will have lots of pictures to sort through when I finish recording the events. We met up with Dave and Donna and Galina and Jon for our welcome glass of wine and then ate a delicious dinner in the hotel’s restaurant, calling it a night at 10ish – tired, happy and slightly tipsy from all the wine! 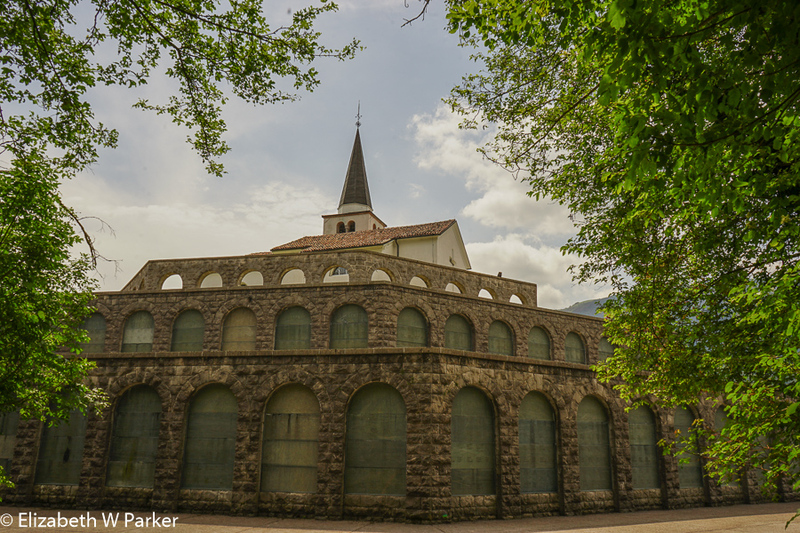 The first, but not the last, image you will see of the famous chapel on Lake Bled. I have really liked Slovenia so far. From here forward our time in Slovenia will be limited to the area around Lake Bled, so I am thankful I have gotten to see so much – both planned and unplanned (thanks to the weather). Driving was never as issue thanks to Gerry, our driver, who navigated the twisty roads and the mountain switchbacks dexterously. The people we met were genuinely friendly and nice – even complete strangers said “Dober dan,” (Good day!) Everything is very clean, bathrooms included. The food is good, and sometimes even great – Like the dinner we had at Dobra Vila our first night. We have sampled local wines – known-to-us grapes like Pinot Noir and Pinot Grigio but with a distinctive Slovenian character that comes from the their soil, especially in the karst region. 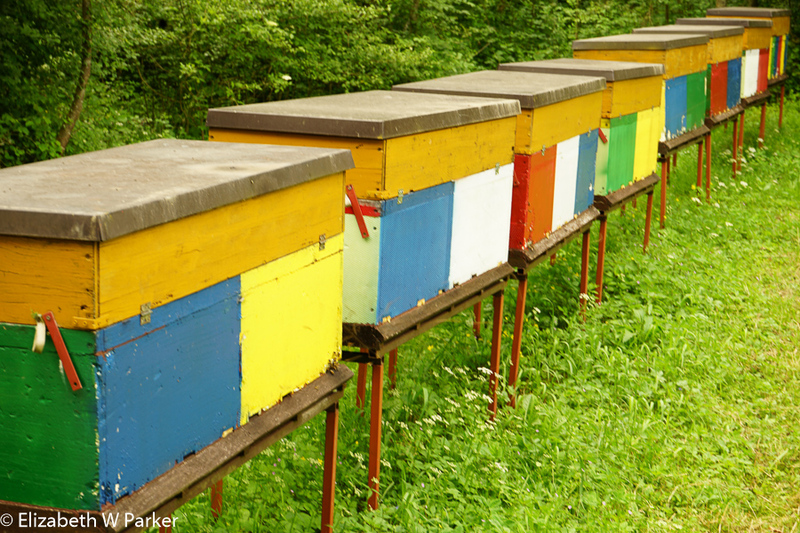 I would like to return to Slovenia, soon, and continue exploring. Probably the best part about Slovenia, and maybe the time of year has something to do with this also, is how few tourists there are. Another aside: One evening we talked about the effect, both micro and macro, of what I will call “tourist fatigue.” You see it so clearly in countries like Italy where tourists are generally treated poorly. After all, who cares, they will probably never return. 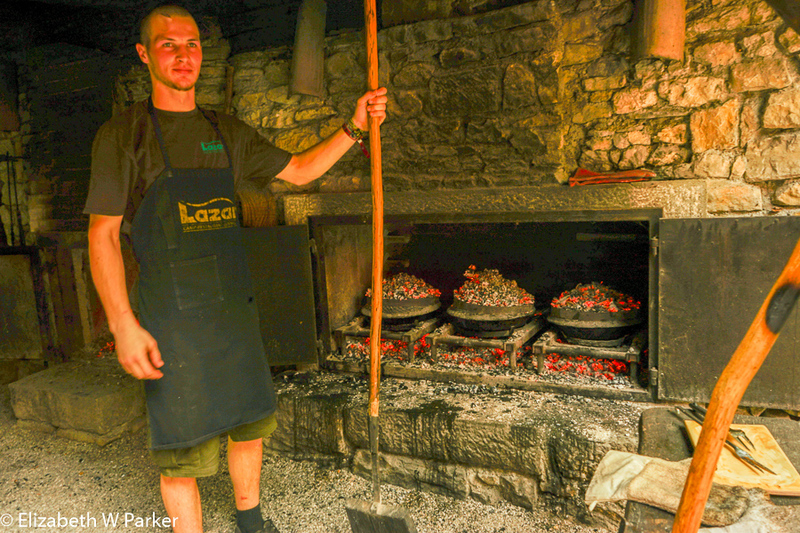 In Slovenia, tourism is a relatively new industry, so there is still an effort to execute well. A little fatigue slips in toward the end of the season I am told (you who travel in the fall take note), but still to a lesser extent than in countries where tourism has been around for a long time and every year more and more visitors come. 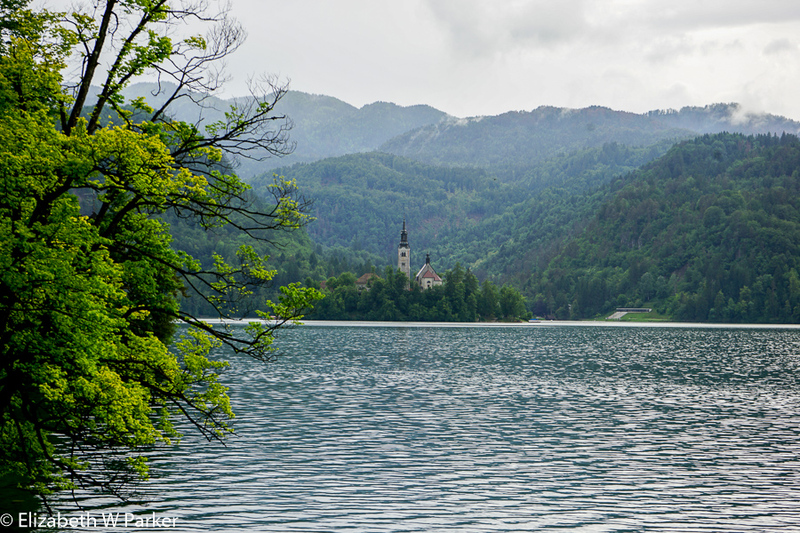 The next section of the journal talks about the two days we spent in the area of Lake Bled. If you would like to continue reading (and I promise lots of pictures) just click here.